Simplifying your life on LinkedIn, Facebook, Twitter, Google+, and other social networks. In 1990, I worked evenings and weekends doing programming for Cayman Systems in Cambridge, MA, both to earn extra money to pay off my college loans and to keep my brain from atrophying in my day job. One day, as the company was struggling with costs, profitability, and competition, I heard one of the founders say, “Well, this company is just an experiment.” Which is both a healthy attitude (for startup types) and unsettling news (for employees). Life, as it turns out, is an experiment. We live, we learn, we change, we grow. So I view social networking as just one chapter in the ongoing experiment that is the book of life. And just as I take more chances in life than most, I take more chances with social networking. Habit #2 of the “The 7 Habits of Highly Effective People” (book by Stephen R. Covey) is “begin with the end in mind.” With social networking, my end game (as modified by this article) is to have a network of people I know and trust, and to grow that network organically. My goal is not to have the most followers. Just like a gardener’s goal shouldn’t be to plant the most weeds, hoping for the occasional fruit. But I certainly didn’t start out as an organic gardener. I’m an early adopter of most new technologies. If I’m doing a thing that nobody else is doing, then I believe the world is wrong, and I keep doing the thing. Then comes mass adoption of the thing. And I don’t like feeling like one of the sheep in the herd. So if I find myself doing a thing that everybody else is doing, then I believe the world is wrong, and I stop doing the thing. Or I do it differently. Or I find a new thing. But not always. It’s complicated. Every three years or so, something new, cool, and seemingly revolutionary happens. I don’t know what will happen next, but I’m pretty sure it’s not nothing, and I’m pretty sure I’ll give it a whirl. Today, when the general consensus is that the more social networking the better, I’m announcing that I’ve taken a different path: less is more. I have scaled back my social networking, including deleting much of the content I’ve created on social networks. Here’s what I did, network by network, and why. Twitter is a social network that is based on short 140-character updates. You can follow anyone, anyone can follow you. You can block anyone, anyone can block you. Anyone can sign up: individuals, brands, anonymous users. In 2008, Twitter and Twitter tools were everywhere. When functionality did not exist in Twitter, users (and occasionally Twitter itself) would create it. Twitter was so popular it was on the verge of becoming a protocol (like SMTP for email). I'm betting that today's decision re software patents (http://tinyurl.com/6699zd) will be appealed. The tinyurl.com URL (http://tinyurl.com/6699zd) resolves to a Google search URL (https://www.google.com/search?q=in+re+bilski). But then a couple of things happened. First, Twitter started looking for ways to make money. And started closing off its once very open ecosystem. Twitter started focusing on what was best for Twitter, and that is not always best for Twitter users. It’s APIs became more restrictive, Twitter acquired popular third-party services, and tried to get more people to go to the Twitter website. Second, I took a hard loook at my followers. And I realized that they were full of robots, spammers, scammers, and the like. In short, I realized that my kids would not be proud of those following me on Twitter. I was embarrassed by my followers. And if you are what you eat, then I think you are also the company you keep, including those who follow you. In short, I was a Twitter whore. The unfollowing and blocking. In the summer of 2009, after peaking (bottoming out?) at 27,035 followers (or so), I decided to unfollow everybody to see what happened. Twitter does not make it easy to unfollow everyone. Twitter doesn’t want its network to have fewer connections, Twitter wants more connections. But I was determined, and two months later, I was following zero users. About 43% of my followers unfollowed me. Many of these followers were using third-party services to auto-unfollow. Just like SEO experts try to game the system by tweaking variables on web pages to get higher rankings in Google, Twitter experts try to game the system by having the “right” ratio of following/followers, the “right” number of Tweets/day, or whatever stat is believed to be important. But many of my followers didn’t care, because they were not real followers. Many of my remaining followers (about 14,000 of them) were still robots, spammers, scammers, and the like. Unfollowing them didn’t make them go away. So I began the even slower task of blocking the bad ones. Twitter really doesn’t want you to block users and limits you to blocking 100 users every 24 hours. You can’t even find which users you’ve blocked and when! The larger your network, the better for Twitter. On 2013-01-13, I had 14,341 followers, and I started blocking the spammy ones at the rate of about 300/week. On 2014-02-19, 401 days later, I had 605 followers. I had blocked at least 13,736 users. In other words, I determined that 95% of my Twitter followers were spam. Anything that a real user can do on the Internet, a spammer can do. And Twitter brought its spam problem upon itself. Because it is so easy to create a Twitter account, real users can signup and start Tweeting quickly. But so can fake users. So I purged everything I could on Twitter of spam: followers, following, lists, direct messages, favorites. Deleting old Tweets. Twitter lets you download an archive of your Tweets (under Settings -> Account). This is the only practical way to view/search all of your past Tweets. Twitter doesn’t want you to delete your Tweets. The larger your network, the better for Twitter. So when you get your archive, you can view your old Tweets, but you have to make a real effort to view them online, where you can delete them. As far as I can tell, there is no limit to the number of Tweets you can delete in a 24-hour period. I reviewed all of my old Tweets and deleted those that had no long-term value. Many referred to services that no longer exist, had URLs that no longer work, or that I’d forgotten about, such as ff.im (FriendFeed), ping.fm (Seesmic Ping), is.gd (a URL-shortener service that was much more popular before Twitter launched its own), and twitpic.com (a photo sharing service that was much more popular before Twitter launched its own). Here is a snapshot of my Twitter usage from 2008-2013. My most loquacious month was March 2009, with 952 Tweets. Yowza. 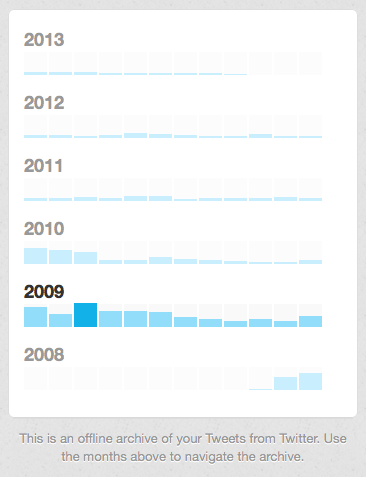 It’s not a surprise to me that my Twitter use peaked from 2009-2010, the same time I was going through separation and divorce. I was pretty lonely during that time, and Twitter was a good companion. I’m also embarrassed at lots of my older Tweets. I was always opinionated, often grumpy, sometimes mean. I sincerely apologize to those I hurt or offended. So I deleted 95% of my 12,500 Tweets. On 2014-03-20, a month after I’d finished blocking my spammy followers, I finished deleting old useless Tweets. In summary, on Twitter, 95% of my network was spammy, and 95% of my Tweets were not worth saving. When LinkedIn was launched in 2003, I don’t think anyone referred to it as a social network. It was really an online business networking service, where professionals could post their resumes and (re)connect with colleagues and classmates. If Twitter is the hare of social networking, then LinkedIn is the tortoise. Bet on the tortoise. I joined LinkedIn in 2003, and it is my only social network that has steadily grown each quarter. LinkedIn allows users to post status updates online, but unlike the other social networks, LinkedIn does not save updates for more than a few weeks. I only recently learned this, and, as a result, I’ve stopped posting updates to LinkedIn. You can also customize what updates you see on LinkedIn (Home -> All Updates -> Customize). I turned off everything and now see only 4 (default) top updates of breaking news stories. It’s like an information diet. I rarely give spammers a second chance (unless their account has been hacked). Once a spammer, always a spammer. Launched in 2011, Google+ is Google’s third or fourth (depending on how you’re counting) foray into social networking. It’s pretty darn good. Because it’s the newest of my social networks, it was also the easiest to purge. I didn’t have to delete many updates. And I pretty much only connect with folks I’ve met in person. One nice feature about Google+ is that it is easy to identify whether (and, if so, how) a new follower is connected to you. From the Google+ “Added you” page (Home -> People -> Added You), you can click through to each new follower’s profile and see if you know people in common. The more popular Google+ gets, the more spammy followers you’ll get. I opted to remove most biological info about me from Google+, since those who have my email address will be able to find me, and since I’ve been at my current job for well over a decade. I’m not sure how helpful it would be to reconnect with someone I worked with 20 years ago. Besides, I feel that my social networking resume belongs primarily on my website, secondarily on LinkedIn. I really don’t want or need to maintain more than a couple versions of my bio and work history online. When Facebook launched in 2004, it was a closed network that was available only to certain Ivy League schools. Since MIT was among one of the early “in” schools, I was able to join Facebook earlier than most in the spring of 2006. Later that year, Facebook opened up to the world. Facebook, like Twitter, was difficult to purge. Twitter lacks a good way to view and edit all of your content. Facebook has timeline review, which is just barely functional, especially if you’ve been posting for a few years. Nevertheless, if you are patient, you can go to the Facebook activity log (Home -> Profile -> Activity Log) to delete, hide, or highlight content in all sorts of categories (your posts, posts you’re tagged in, posts by others, posts you’ve hidden, photos, likes, comments, about, friends, notes, music, news, video, games, books, products, following, groups, events, questions, search history, and apps). I noticed that a few events that were created before Facebook’s latest events interface did not show up under the “events” section but did (if you were patient) show up under your timeline. I found events (with photos and videos) that I had long since forgotten about and deleted most of them. Similarly, I have a couple of “phantom” likes: pages that I liked that later merged with other pages, and I cannot unlike the page because the original URL no longer exists. As such, my like count is not zero; I’m assuming Facebook will eventually fix this bug. In any event, I deleted most of my content, unliked everything, and deleted most of my biological info (as I did on Google+). The above simplification was based on a LifeHacker article about minimal email signatures. And if you have ever called my cell and gotten voice mail, then you know it sounds a lot like the above looks: “My name is Erik Heels, and this is my voice mail.” That’s all you need to know. Each month, I review email from 10+ years ago. I star and save the good stuff, I delete the rest. On my website and blog, I removed the social networking plugins that added those “share to Facebook” (and the like) links to each of my posts. I removed all SEO plugins from my WordPress blogs. I think SEO is largely deceptive. If you write one title that is visible on Google, and another title appears on the website, how is that better? Besides, my business is B2B, not B2C, with my website/blog being used to validate a referral, not generate a lead. Most SEO consultants will tell you that I’m wrong, but consider the source. SEO works best for SEO consultants. You want good SEO? Write good content, good SEO will follow. I want to use my website to drive website traffic. I want to use my newsletter to drive newsletter subscriptions. 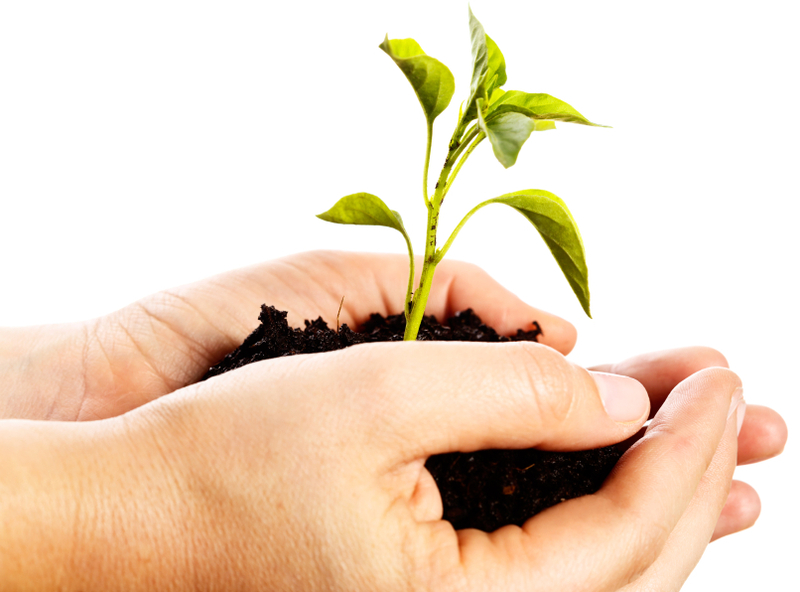 I want to use each of my social networks to grow each of my social networks. I want to garden organically. I write primarily about law, technology, baseball, and music. Going forward, I am limiting my posts to those that cover at least two of these categories – or one in depth. More signal, less noise. My recent blog post about Shane Victorino’s intro music is a good example, as it is about both baseball and music. One thing I noticed about my old Tweets: many were about Twitter. Many early Facebook posts were about Facebook. Early Google+ posts were about Google. And that’s the way, uh huh, uh huh, they like it! But I can tell you this definitively: Apple, Google, Microsoft, LinkedIn, Facebook, and Twitter don’t need the press. If you can avoid writing about them, then your content will be better. And, yes, I’m aware of the irony. This may very well be my last post on this topic. I feel I owed an explanation to those who may have been wondering where I’ve been, and an apology to those I hurt (sorry). I follow people I know and trust. You know who you are. I don’t follow brands (not even my own). I want to connect with the people behind the brands. I don’t let brands follow me, unless they are directly connected to me (like my own companies). I block anyone who acts spammy. I use LinkedIn for my resume. I use YouTube for videos that contain original music and videos that do not contain music. I use Facebook for videos that contain music (except original music). Facebook does copyright fair use way better than Google/YouTube does. I use Facebook for photos, so I can easily share pics with those who are not on Facebook. At least until Facebook eliminates this feature. At some point in our lives, we start valuing our space more than the things that take up that space. That’s partially why my parents initially downsized from a house into a condo. But just like there is no house that is ideal for all, there are no universal social networking rules. There is no right, there is no wrong. You don’t have to over-think it (as I admittedly may have done), but you should definitely think about it. A parting exercise. Go to your Twitter followers page. Scroll down to the middle. Take a screen shot. Do you like what you see? You’re looking in the mirror. What would the king of pop do? You can’t plant a garden and reserve a spot for weeds, the weeds always win. The Most Random Number Is 17. Technology, Law, Baseball, Rock ‘n’ Roll. It’s not the seeds that matter, it’s the flowers. Any why Facebook is panicking. Social networking is not magic. Email is social networking glue. I started this as an email and decided to make it a blog post instead. Hence the format. All web pages are shareable items. All titles are Twitter tweets. Get used to it. It took a month, but the intertweets found the limits of Google Reader Shared Items Notes. It’s about 64K. Mmkay? The more you hide your content, the less relevant it becomes. How to visualize social networking. Don’t start a weblog. Replace your website with a weblog. In November 2002, I started experimenting with weblog software. Three months into the experiment, I had converted my existing website into a weblog powered by Radio Userland Software. After only two months, I switched to the much more capable Movable Type software. 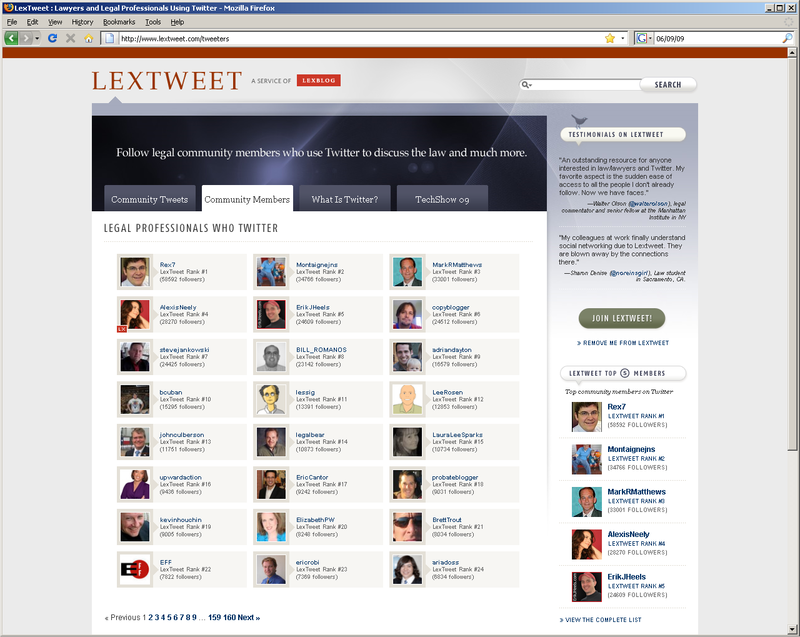 In this article, I discuss what I did, how I did it, and why some law firms are catching weblog fever. The business of law is a conversation. Are you conversing? Added 500+ non-spammy Twitter followers to lists with http://tweetbe.at. Unblocked 24K (mostly spammy) former Twitter followers with http://blockedby.me. I now realize that I won’t be able to solve the huge problem of social networking spam by personally blocking all of the spammers. So I’ve re-re-focused by social networking efforts. To the extent possible, I unblocked all those I’d blocked on Facebook, Twitter, and Google+. (I am unaware of a blocking feature on LinkedIn.) In short, the more intimate the social network, the fewer connections I have, and the more I share. LinkedIn – My largest network, but I no longer post updates (as they are deleted after a couple of weeks). Twitter – My second largest network. I post TLBM (technology, law, baseball, music) content here. A handful of times per month. Facebook – My smallest network. I post TLBM content here. And personal photos. Google+ – I’m taking a break from Google Plus. Since I use Google Apps for Clocktower, I have always had two Google accounts, one personal, one work. Constantly switching between the two accounts became too much of a burden. While I’m slowly moving stuff from my personal account to my work account, I’ve pretty much abandoned Google+ at this point. So that’s the state of my social networking today. But like New England weather, it will change with time.